Ancient Attire & Body Modifications - I.N.A.S.C.A. 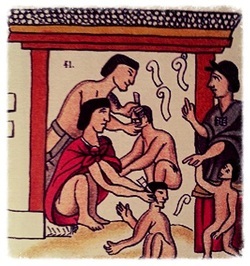 In this class, we will learn about the significance and use of ear expansions, body painting, tattoos and insignias in ancient Mesoamerican Societies. From their bioenergetic effects to their symbolism, we will learn how different stones and different styles signified different ranks and levels of knowledge. We will also learn how we can begin the process of expanding our ears or obtaining a tattoo in the ancient ceremonial manners.